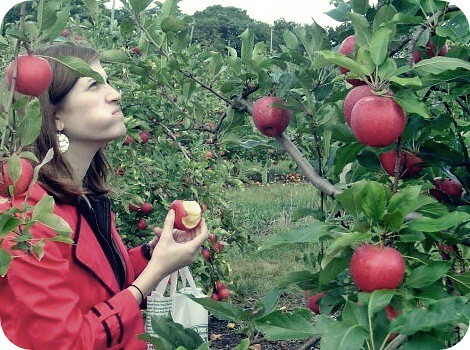 The Apron Archives started as a food blog in 2010, but has evolved into food, travel, and general commentary on life in New England — when I can get to it! Striving for deep and simple. Fond of history, making good food, seeing new places, and bothering my cat. I view things through the lens of someone born in the early 80s. This means that I was lucky enough to make it through high school without an email address and college without a cell phone, but now have (and mostly love) both. I live in Manchester, New Hampshire with my husband John and our cat, Bones, and work as the digital editor at Yankee Magazine and NewEngland.com. I’d love to hear from you. Feel free to comment, email me at theapronarchives (at) gmail (dot) com, or say hello on Instagram — my preferred social media outlet. You are adorable. I think your blog is great and couldn’t agree more with your likes of New England. We are certainly blessed to be living in an area full of history and beauty…I look forward to being an avid reader of A&A. It’s already bookmarked on my homepage. Thanks for the intro friend! We love your blog here at Yankee Magazine! I just visited your site for the first time. Your recipes look awesome–I’ll definitely try some out. I found your blog through jenloveskev’s blogroll and everything looks wonderful! I also can’t agree more with your loves of NE. I’ve been living here for a few years now and even though I cried the first time my boyfriend’s mom put a steamed lobster in front of me I have grown to love this place. I am just getting into the blogging community again but I will definitely add this to my come-back list. Hi Erin! Sorry for my late reply – that’s what happens when I check email on the bus! I love jen(loveskev) – so glad you visited me here! I couldn’t help but laugh at the thought of you crying at the sight of a steamed lobster…but you had every right to cry! Those things are terrifying. Like enormous bugs! Glad you are sticking around. I will be visiting your blog too! I just your recipe for Anadama Bread in Yankee magazine and can’t wait to make the bread myself. I love old cookbooks especially regional ones. I don’t even care what region they are from, but New England is my favorite. I was wondering if you remember a recipe called Fieldmouse Pie? In high school I took a course about New England and had to make a dish using an old recipe. I made this dish and the teacher didn’t tell anyone the name until after they ate it. I make sure they knew that there were no mice in the pan! The recipe came from Yankee, but noone else remembers it. That recipe sparked my interest in old recipes and that continues today. I look forward to reading your blog. Hi Kathleen! You sound like a girl after my own heart. I can’t resist an old cookbook – and the stranger the recipe sounds, the more I want to try it. It’s so funny that you mentioned Fieldmouse Pie! 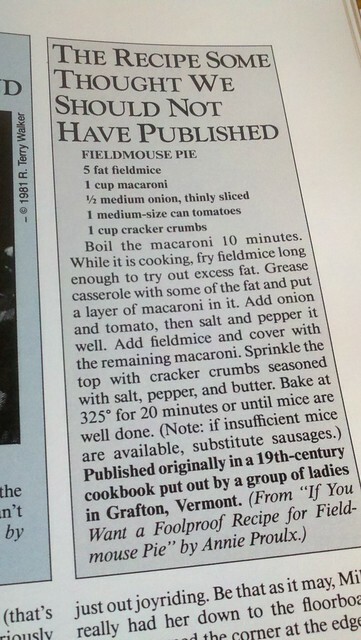 I recently picked up a copy of a 1985 book Yankee put out to mark their 50th anniversary called “The Best of Yankee Magazine”, and inside they mentioned “The Recipe Some Thought We Should Not Have Published” as….Fieldmouse Pie! Hope this helps – or at least entertains. Thanks so much for visiting The Apron Archives! It has been a silly long time since our days at Framingham State (and Wakefield)! I love your site! I saw your doppelganger the other day on my commute home from Longwood. Just curious if you’re in the city these days. It would be great to catch up! Jess! That is totally me! Sometimes I see you too and I have wanted to say hello, but I wasn’t sure you would remember me and the bus is just such a poor place to talk to anyone…especially during rush hour. Gross. One of these times let’s make sure to say hi – or maybe meet for lunch somewhere in the LMA? I’d love to catch up, too! Sorry for the delay! Awesome, let’s catch up! Any day(s) that work best for you? I live right across the river in Cambridge so I’m pretty flexible. Oh that 47 is an angry beast!! I was just wondering, How did people feel when you changed the name of your blog? I was thinking of doing the same, and I thought I’d ask you for advice! First off, I love your blog! I am glad you have been updating more lately! I decided to make the name change before I registered a domain name. I had started my blog without realizing what direction I would want to take it in, or what kind of name I would want to use “forever,” since most blogs don’t end up being something you keep at for years. Once I picked my new name, I registered the domain and changed the header on my site, but kept WordPress as my host so I could set it up to automatically redirect visitors to the new site. I definitely didn’t lose anyone by doing this – if anything I gained some readers (I think) because I had a much clearer focus on what I was writing about, and my name reflected that! If you want to chat more about any of this stuff send me an email anytime to theapronarchives@gmail.com – I can’t wait to see what you do with your site! Ursula, your blog looks divine. Chocolate on the front page? Oh, yes. You are a keeper. I stumbled upon your blog last week and you were featured in my FoodPress RSS feed so I am taking that as a sign and making the Apron Archives a weekly stop. it. I’ve had it for 30 years. Lots of fun. I’m from Wakefield Ma, but, now live in NH. Great Anadama bread recipe. I went to a talk at the Sturgis Library in Barnstable on colonial cooking, and they had a recipe for Anadama bread, with instructions such as ‘add enough flour to make a stiff dough’.. which I worked, trial an error, to adjust for my bread machine, and now have a perfect recipe which always gets rave reviews. I am also a proud New Englander (from not quite so beautiful Springfield, Massachusetts). I love New England food and I love New England more then any other place in the world and would never live anywhere else. Altho I would like to live someplace other then Springfield. Any place really. Well except Holyoke. Aimee, you are my baking hero. 🙂 You have made my lazy Tuesday morning absolutely shine. There is nothing I’d rather be doing right now than sitting back in my comfy chair with my favorite purple ballpoint pen and some notebook paper, copying down all your recipes that I’m so, SO excited to try! My husband and I host at a prayer house, and part of our job description is to have a tray of cookies out for the groups who come by to pray. I’ve been doing pretty well on my own for the past month, but now I’m just inspired! Chocolate cherry scones? Cranberry coins? Strawberry cool whip cookies? Oh goodness, these poor people’s waistlines won’t stand a chance! Thanks for making baking fun. You are a jewel. Oh, I just love this website! I went to Franklin Pierce university back when it was just a College and I long for mellow New Hampshire Summers and crispy, cool Falls! I stumbled upon you looking for a Chocolate Chip Cookie recipe and I will return for your like-minded love of the vintage and the delicious kitchen! I want to buy one of your heart shaped sprinkler heads also know as a steampunk sprinkler.You have three sitting together and one of them is $48. Are they available to buy? Ken Doop in Wenatchee, Washington.